SiteInfo eliminates loss, makes transports more effective and reduces lead times with up to 88%. MCD is Scandinavia’s leading supplier of level measurement. With our smart level measuring systems and our in-house developed communication solution we supply cloud-based level measurement services to companies managing different types of bulk products, in both liquid and solid form. We supply a fully integrated level measurement system, from the sensor in the tank, to the communication solution and on to our site for level presentation SiteInfo. 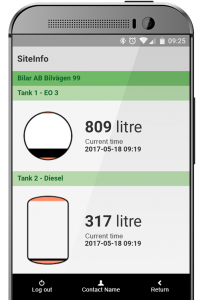 Throug SiteInfo, you gain complete control of the levels in your tank, deliveries and frequencies, it is then easy to gain access to history and statistics. We will help you to connect your present level measurement system or replace it with a complete, fully integrated solution. We find it easy to communicate with MCD if something should happen; the company is always on the ball. What do we provide that no one else does? EFECTIVITY. After more than 30 years in the business of searching for a more effective management of oil and chemicals we dare to claim that we have learned how to save time and money for our customers and also provide a positive benefit for the environment. No unnecessary waste and more effective deliveries make our job and yours more sustainable. You gain complete control over the levels in your tanks and your tanks will never run dry again. Furthermore we can promise that you won’t have to deal with manual administration with regard to the refilling of tanks. It is easy to get started. Contact us and we will tell you how it works.